Hello Friends! I'm here today to share something that I think is going to be SUPER fun! Just like the title of my post says, it's a 30 Day Coloring Challenge. The challenge has been issued by the very talented Kathy Racoosin of The Daily Marker blog. The idea behind the challenge is to COLOR. That's it. Just color to color...not to make a card, or project, just have fun coloring. We are to take some time each day for thirty days, even if it's just 10 minutes, to color. I LOVE that! 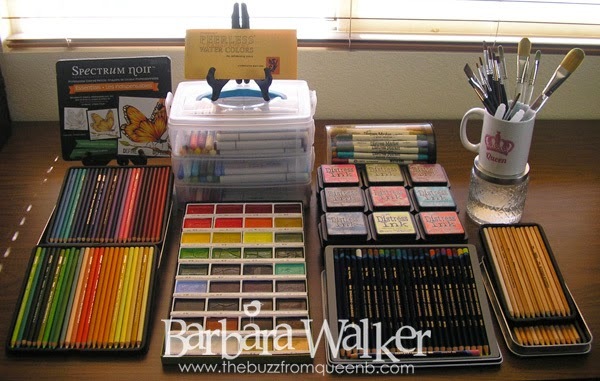 This is an opportunity to explore new techniques and to use products that have been neglected or perhaps it's time to invest in a few new items to add to your coloring media collection. I'm super excited about joining the challenge because coloring is my first love and I look forward to getting into my studio and having a fun coloring session. Our first order of business was to organize our supplies. I decided to "display" my coloring media on one of my work surfaces. That way, I can select which medium I would like to use quickly and easily. My stamps and various types of paper are nearby, as well. The challenge starts on Wednesday, March 4, 2015. It's going to be fun! Won't you join us?! Oh Barb, I'm so happy for you to be doing this! I know you are going to have a lot of fun. And I hope you'll share a teensy bit of what you are coloring. I love your display. :) Hugs!